The TOPIK results were released today at 3pm Korean time, which meant 3am here (in Toronto)! I didn’t stay up for it last night, but I’ve been having anxious dreams about it for a few hours now this morning so I decided to get up super early and check my results. I can’t believe it! 6급… 합격?! ?1 Oh my god! I was really just shooting for 5급 so this is amazing. I felt like I’d done well on the 어휘/문법 section, but I found the 듣기 part really difficult because I was so nervous I wasn’t able to pay attention well. I’m so relieved and thrilled! Of course, this makes me want to study more now, and not less. I mean, according to the TOPIK website I’m now supposed to be “absolutely fluent in the Korean language for professional research or work”, which is hilariously untrue. My speaking skills are still very lacking and I definitely cannot understand everything I hear. And there is still plenty of vocab I don’t know. But this has given me a bit of a confidence boost and now I’m excited to hit the books some more! Now I’m heading back to bed for some more sleep – this time without the nervous dreaming about failing grades! One of the best parts of studying Korean lately has been doing language exchanges. Like I mentioned in my last entry, I went to my first Say Kimchi meeting a few weeks ago. It’s a Korean/English language exchange in Toronto that’s apparently been going on for years and I never knew about it (fail!!). It’s organized really well, with the intention of having an equal number of Koreans and English speakers so that we can all partner up. We speak in Korean for 45 minutes and then switch to English for another 45 minutes. The organizers even bring textbook printouts for the Korean learners and fun lessons about idioms and slang for the English learners, so that the partners have things to go over and talk about. Then we go to a restaurant after to talk more! So fun! I’ve met some really interesting people, including some Koreans who are actually planning to stay in Canada and not go back to Korea after a year, which is great. I’ve made great Korean friends before in Toronto but since they were all here as international students on exchanges, they had to go back to Korea for a year and we’ve lost touch. Even in this age of 카톡 and facebook it can be hard to stay connected when you can’t see a person in real life once and awhile. So I’m really glad to find some people who are planning to stick around here! I’ve also been running the language exchange at my university, which meets once a week. We’ve had an uneven ratio of English speakers to Korean speakers lately, with most of the students attending being university students who are studying Korean, so I went on a promotion spree and sent flyers to ESL schools and English language programs at local colleges, and it totally worked! Last week we had equal numbers of Koreans and English speakers! Woohoo!! I’ve been feeling a little burnt out from studying today. Although it’s only the first week back of the semester, I spent almost every day of the winter break studying Korean, and I think it’s just been too much. I spent almost 5 hours today going through flash cards, to the point that when I stopped my eyes were all out of focus, haha. I’m going to take the rest of the day off and try not to feel bad about it. There’s still 3 months and a bit until TOPIK!! I need to chill out. So the day after I resolve to stick to consistent study methods, I end up stumbling upon the TOPIK Korea channel on Youtube and spending all day watching these vids -_-. Oi. Oh well, it was really educational! The teachers break down the four sections of two of the most recent TOPIK tests and go through each question one by one, explaining all of the possible answer choices. Awesome, right? I learnt a lot of points that either I’ve never learnt before, or had completely forgotten. The unfortunate thing is that they only have the complete series uploaded for the Intermediate level. There is one Advanced video but it’s only one question from each section 😦 It’s like an MV teaser… that is never followed by the full version. ._. Anyway, the teachers are really great. The instruction is done entirely in Korean, which is ideal, and they speak very clearly so it’s easy to understand. The teacher who does the Grammar section is particularly helpful, and she really reminds me of Kim Sun Ah. The way she drags her vowels out at the end of some sentences sounds just like her, haha. I’ve embedded the videos for test 25 under the cut, but they’ve got videos for test 26 on their Youtube channel too! Happy studying! So it’s finally 2013… 2012 was a hard year for me, but as always I’m hoping this year will be better. 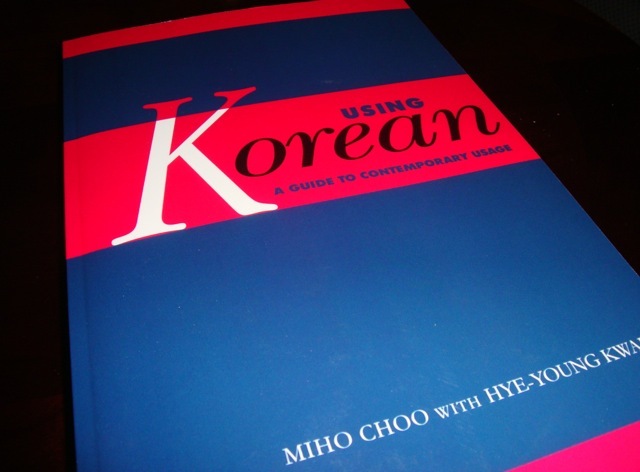 🙂 One thing is for certain, I will be keeping up my Korean studying – even if I have to start learning Japanese this year (I have to know two Asian languages to get a doctorate degree D:). I don’t like to make resolutions, but one thing I would like to change this year is my methods of studying. I know I will keep studying, because I love it so much and because I have the goal of passing level 5 TOPIK. But I am really bad at sticking to a certain method of studying! I keep jumping back and forth between different things – like I’ll watch 3.5 episodes of a drama and take notes, and then flip through a grammar book, and then do some old TOPIK tests… but I never actually complete a drama or get through a whole book or finish all the old TOPIK tests… so I don’t feel like I’ve accomplished anything! Also I keep finding new books I want when I haven’t even gotten through the books I have!! I get really frustrated with myself haha. So my plan for the new year is to try my best to continuously work on one method of studying until it’s completed so that I can feel like my time isn’t being wasted. I’ve spent a lot of time studying over the break but because I can’t say that I finished any project, it’s hard to feel satisfied. Speaking of my inconsistent studying methods, I’ve updated pineapplegame again. For some reason, I find the ~니까 grammar structure different to wrap my head around because there’s so many different ways to use it – and yet they’re all very specific. 헐. Anyway. Happy studying everyone!